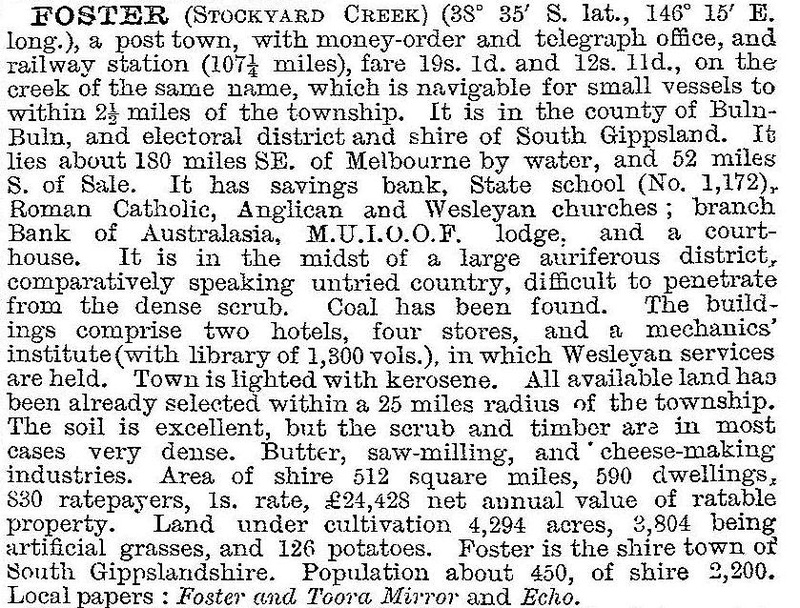 Foster, a rural town, is 150 km south-east of Melbourne. It is on the South Gippsland Highway and 45 km north of Tidal River, Wilson’s Promontory. The town is on Stockyard Creek, about 5 km upstream of the creek’s mouth on Corner Inlet. The creek was used to transport and spell livestock being taken from east Gippsland to the Western Port district. In 1869 some timber harvesters at Stockyard Creek discovered alluvial gold there, and by the middle of the next year about 30 miners were working claims. In early 1871 the number had grown to about 200. A mining dispute brought the local magistrate and gold warden, William Foster, from Sale and his successful settlement of the matter resulted in the miners naming the place after him. By the middle of 1871 tracks were cut from Moe and Rosedale to Foster. The town’s early token of civilisation, a mechanics’ institute, also opened that year. A post office and a school opened in 1872 and a Methodist church opened in 1874. Downstream there was a boat landing for incoming and outgoing mail, where there were one or two hotels in addition to the several in Foster. In 1872 a telegraph line was connected to the landing. There were several other gold finds around Foster which kept up activity until 1877 when it was reported that mining became depressed, despite the discovery of a few new leads. Land seekers were needed in place of gold seekers. Foster’s hills were moist, fertile and tree covered. Farm selections on the coastal plains around Welshpool and Hedley were nearly all taken up by the early 1880s, and in 1884 selectors came to Foster, attracted by the moist conditions after a severe Victorian drought a few years before. Land selection legislation was also more favourable. Within two years all available farm blocks around Foster were occupied. In 1892 the Great Southern Gippsland railway was extended from Korumburra to Foster and Toora. The increasing town and farm populations felt that they were being neglected by Alberton shire council and successfully agitated for severance. South Gippsland shire, headquartered at Foster, was formed in 1894. In the year this description was published Foster held its first agricultural show and opened its district cooperative dairy factory. The cooperative purchased a small factory that had operated for ten years. Although burnt down in 1917 the factory was quickly rebuilt. By then electric power was available from the Toora and Foster light and power company, generated at Kewita Falls on the Franklin River (1916). Power was also delivered for houses and street lighting. In 1919 Foster’s State primary school became a higher elementary school, the first of several steps making Foster a sub-regional education centre. In 1937 a private hospital was taken over as a community hospital, becoming a public hospital in 1941. From the 1950s Foster was firmly established as the district centre. The high school (1952) and hospital were expanded and a consolidated school established when senior classes moved to the high school. Buses brought pupils from the surrounding district to the Foster primary school resulting in the closure of some small district schools. New shire offices and an arts centre were built in 1960 and 1966. A number of government departments established offices and depots at Foster. Many properties in the hill country north of Foster had been abandoned since the mid-1920s, the farmers defeated by the steep terrain, the mud and the poor roads. From the 1950s large areas were taken over by the Forests Commission and reforested with softwood and hardwood plantations. However, postwar soldier settlement at Yanakie, 15 km to the south, brought more dairy farmers to the area. In 1962, the butter factory amalgamated with a larger company, which eventually merged with Murray Goulburn. Foster’s milk factory closed in 1975, and milk was transported to Toora and Leongatha. From the 1970s dairy farms increased in size with amalgamation of properties. But there was also a proliferation of hobby farms and holiday houses in the hills and near the coast. Foster is still the service centre for the surrounding agricultural district. But traders have benefitted from a large number of tourists because of Foster’s proximity to Wilson’s Promontory, the coast, beaches and the hills. A craft market, held at Foster showground since 1979, attracts several thousand people on long weekends in summer. Stockyard Gallery displays the work of local craftspeople, as well as housing a tourist information office. The railway closed in 1993 and the track became a walking and cycling trail. Foster has the South Gippsland Hospital, a public hall, primary school (198 pupils, 2014) Anglican, Catholic and Uniting churches, a showground, a golf course, a caravan park, swimming and bowls venues and an active Main Street shopping area. The court house (1888) is a community house and the former post office (1890) is an historical museum. At the 2011 census dairy farming accounted for 7.5% of employment and other farming 4.7% in Foster and environs.